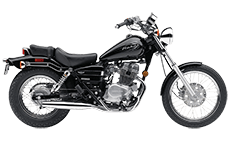 The compact engine size and comfortable body lends itself useful to beginner riders, but the Honda Rebel CMX250c is quite a spectacular motorcycle on its own. Whether this is a starter bike or a hand-me-down, you'll agree that the right pair of saddlebags mounted to the side can really make this motorcycle a more attractive and functional vehicle. No matter what kind of rider you are, we have a Viking Bags luggage solution perfect for your CMX250c! If you need more information about specs and features, you can check the individual pages here or give us a call.